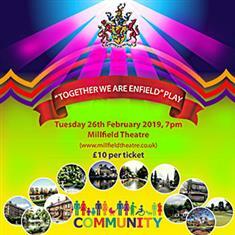 This unique event introduces many aspects of Enfield that sometimes get forgotten and many people who live here need to be acknowledged for the wonderful work and voluntary services that they provide the people of Enfield and protect beauties of the borough, providing positive outcomes for the community. It's hope is to encourage integration and community spirit which often gets lost in daily life. It incorporates elements of dance, music, laughter, love and sadness.